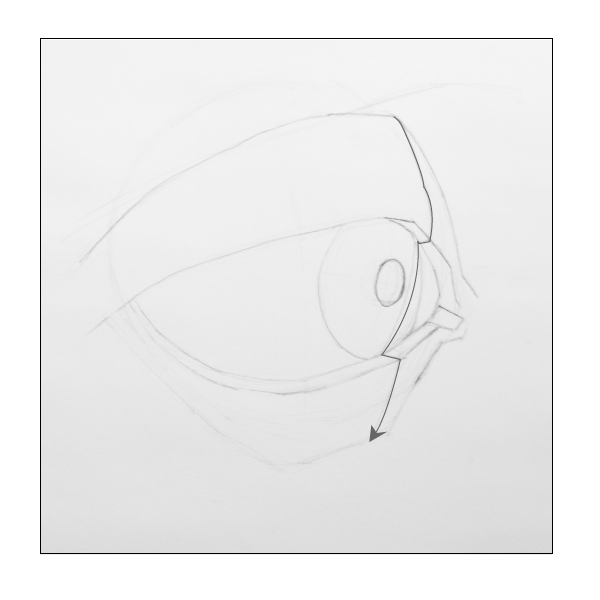 When drawing or constructing an eye, it is good to consider the hidden forms that shape the elements on and around the eye, like the shape of the eye itself, the bone structure of the eye socket, and any muscles around the eye. The eye has form and volume. It sits in a recessed part of the head with the brow protruding over the front plane of the eye. 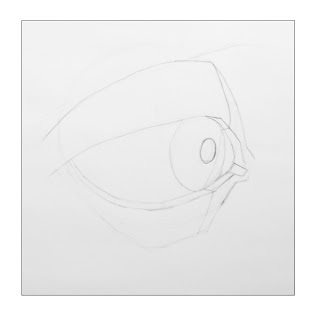 Learning the basic form of the eye will assist you in drawing eyes more realistically. 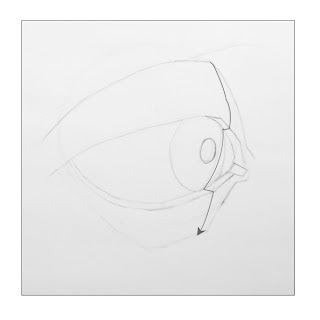 First, lets look at the basic shape of the eye and how the eyelids wrap around it. The basic form of the eyeball is a sphere. The eyelids wrap around the sphere to cover most of the ball. Only a small part of the eyeball is visible. To the right, I have overlaid a sphere as it relates to the drawing to show how the eyelids wrap around the ball to create their shapes. 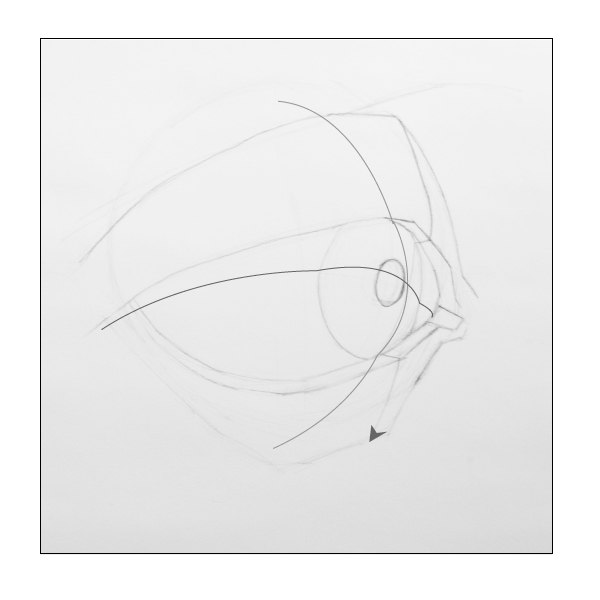 In this next diagram, the line running down the eye shows that the eyelids have a thickness that give an edge to the lids. This is important because the top plane of the lower lid, or the edge of that eyelid, will usually be facing the light source and be brighter than the areas around it. 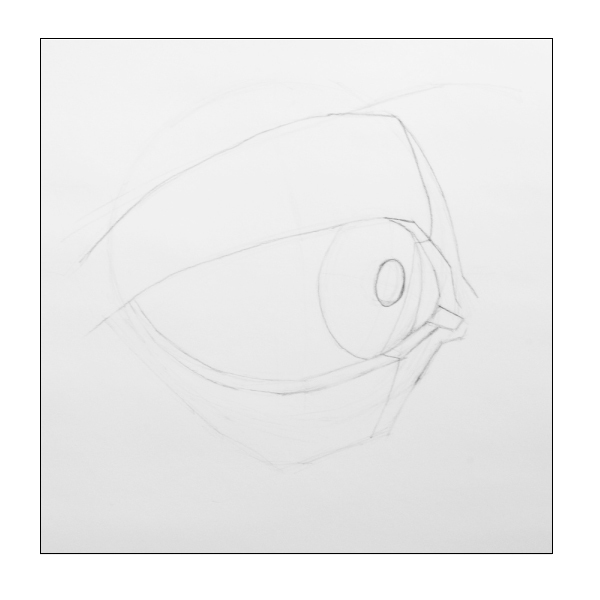 Also, because there is a thickness to the upper eyelid there will be a small shadow cast onto the eye. The part of the eye that contains the pupil, iris, and lens also rises from the general spherical shape of the eyeball. Because of the cornea, the eye rises up like a mound on the eye. The shape the eyelids are affected by this mound as a person moves their eyes around, looking to the left, right, up, or down. Since the eye socket is usually being blocked from any direct light, the features of the eye will appear darker than the surrounding areas. This is important to remember when dealing with the whites of the eyes. 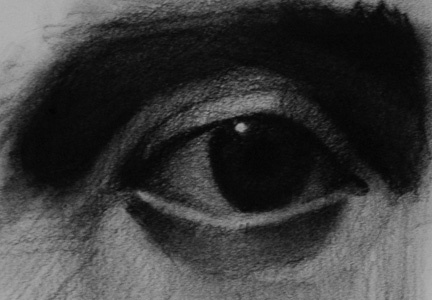 When realistically drawing eyes, the whites of the eye are not white, they are much darker in value. Different areas on the whites of the eye will also vary in value because the eye is round. The only part of the eye that is white or near white in the value range is the highlight, if one is present. Remember the eye is a sphere and the shapes of the lid are a result of that shape. 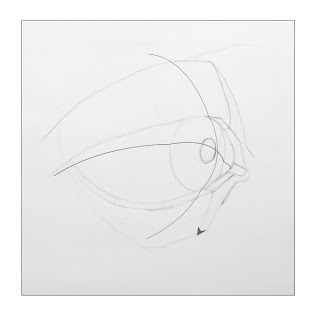 When drawing the eye look for plane changes in the eye, on the eye lids, and the in surfaces of the eye socket. Also, keep the value relationships correct as the eye will usually be darker than the surrounding areas of the head.